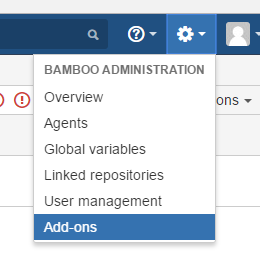 Bamboo from Atlassian is a platform for managing a release pipeline. This includes building, deploying, testing and distributing software, which obviously makes it an interesting integration point for Leaptest. To make it easy to use Leaptest as part of a release pipeline, “friends of Leaptest” has developed an opensource native plugin to Bamboo. 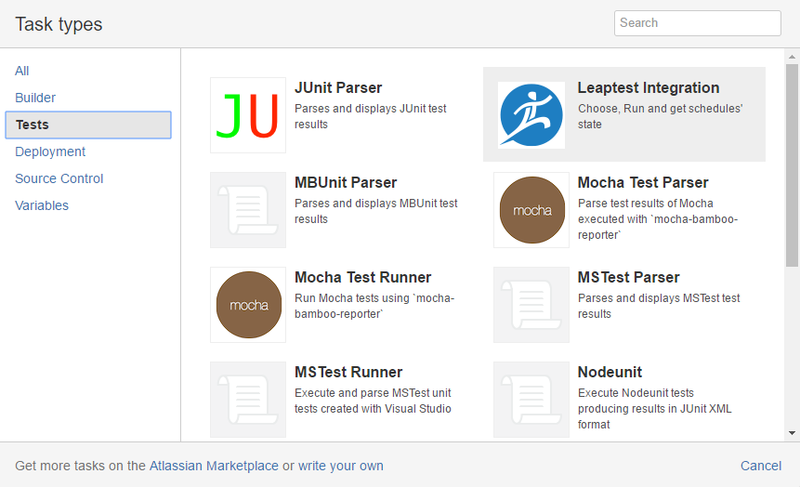 You can find information about the plugin here: https://github.com/Customatics/Leaptest-For-Bamboo. In the following we will walk through the installation of the plugin and how to add a Leaptest task to a build plan in Bamboo. The guide below assumes that you have a running version of Bamboo and that you have a basic understanding of both Bamboo and Leaptest. Once you see the “Installed and ready to go!” – well then the the plugin is correctly installed. Be aware that 2 errors can occur at this stage – please ignore these errors, it’s because of a server setting for the ‘home address’ (‘localhost’ versus the IP address of the machine Bamboo is running on). Create or open the build plan where you want to trigger Leaptest from. Select “Configure plan” from the “Actions” menu. Open the Stage and Job where you want to trigger Leaptest from (i.e. “Default Stage” -> “Default Job”) and click “Add task”. In the “Task types” dialog select “Tests” in the left menu and click on “Leaptest Integration”. This will add a Leaptest integration job to the Job. Plugin version – should match the one downloaded and installed from the GitHub repository. It’s possible to have multiple versions installed. Server URL: the location of the Leaptest Controller which has a public REST API. (i.e. ‘http://localhost:9000’, ‘http://myserver.internal-domain.dom:9123’). Schedules names: A Schedule is a selection of one or more Leaptest test cases, and is created and maintained in Leaptest. By selecting one or more Schedules the test cases in the Schedule(s) will be executed when the Bamboo task is executed. Pressing ‘Select Schedules’ opens a list of the Projects in Leaptest and by expanding the individual projects one or more Schedules can be selected. To read the test results correctly back into Bamboo, add a ‘JUnit Parser’ task after the ‘Leaptest Integration’ task added above. 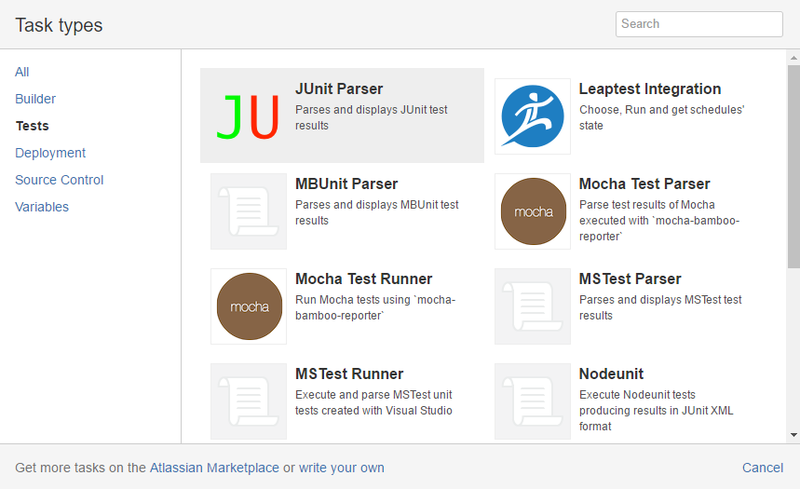 Click ‘Add task’, select ‘Tests’ and select the ‘JUnit Parser’ plugin. In the ‘JUnit Parser’ configuration add a ‘Description’ and change the ‘Specify custom results directories’ to the value ‘report.xml’ (if it’s changed in 9.6 this should have the same value). You now have a base setup and are ready to run the build plan.